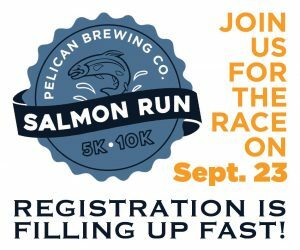 Registration is still open for the inaugural Pelican Brewing Salmon Run in Tillamook, Saturday, September 23, 10 a.m.
Pacific City, Oregon (September 11, 2017)—Registration is still open for the Pelican Brewing Company’s inaugural Pelican Brewing Salmon Run, Saturday, September 23rd at 10 a.m. Pelican’s first ever 5K and 10K run is a fund- and awareness-raiser for The Salmon SuperHwy, an ambitious salmon habitat restoration initiative in Tillamook County. Runners can register online through Thursday, September 21, 5 p.m. and in-person at the Packet Pick-up event at the Tillamook Brewpub on Friday, September 22 from 11 a.m. to 8 p.m. The race will start and finish at the Tillamook Pelican Brewery & Tap Room and runners will enjoy a post-race bash at the brewery featuring brewery tours, live music, food and crisp thirst-quenching Pelican brews. 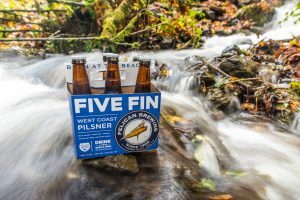 Pelican last year brewed its award-winning Five Fin West Coast Pilsner especially to support the salmon recovery efforts. Oregonians can assist the massive effort to restore access to almost 180 miles of blocked habitat throughout six major salmon & steelhead rivers of Oregon’s North Coast by participating in the Pelican Brewing Salmon Run and of course drinking Five Fin! A portion of proceeds go directly to The Salmon SuperHwy. The entry fee for the 5K is $45 and $50 for 10K through September 21 with free entry for children 5 years of age and younger. Everyone who registers receives an official race shirt and an official race pint glass. Those 21 years of age or older will receive a pint of Pelican’s Five Fin West Coast Pilsner (21 years and above). Runners under the age of 21 will be treated to a pint of Pelican Brewing Root Beer. Pelican Brewing Company was founded in 1996 by Jeff Schons and Mary Jones in Pacific City with Oregon’s only oceanfront brewpub. Celebrating its 20th year, the brewing company has created masterpieces like Kiwanda Cream Ale, India Pelican Ale, MacPelican’s Scottish Ale, Tsunami Stout and Doryman’s Dark. With the vision, creativity and brewing expertise of founding brewmaster Darron Welch, Pelican Brewing has won over 450 awards including a Silver Medal at the 2016 Great American Beer Festival, 2014 World Beer Cup© Champion Small Brewing Company and Brewmaster of the Year. Pelican Brewing currently distributes 22oz bottles, 12oz bottles in 6-packs, a new mixed 12-pack, and 50 liter and 20 liter kegs via a network of distributors in Oregon, Washington, Idaho, Nevada, Utah, Hawaii and Vermont. The company operates brewing and brewpub facilities in Pacific City, Tillamook and Cannon Beach.